Time for Part 2 of Sydney's Royal Jewel Questionnaire! You can read part one over here, and don't forget to jump over to her blog, Confessions of a Castleholic, to see me nattering on about my favorite castles! QUESTION #5: You have a magic wand and the opportunity to make your least favorite piece of royal jewelry disappear from public view forever. Which one would you choose? Probably Queen Margrethe’s Golden Poppies – I can get over bad jewellery designs if the intention was good but who thought it would be a good idea to stick large golden poppies and bugs all over someone’s head in the first place?! QUESTION #6: Your magic wand also lets you recover one piece of lost royal jewelry -- which one do you magically bring back to life? QUESTION #7: You're a crown princess, and you're having an enormously grand royal wedding. Which royal wedding jewelry would you choose to wear? I think I'd go for what Crown Princess Victoria wore. The Cameo Tiara usually wouldn't rank up on top of my list but it all came together beautifully that day and it gave her a one of a kind look. 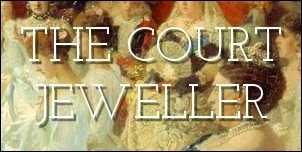 QUESTION #8: And now, for the most challenging jewel game of all, The Court Jeweller's tiara version of "shag, marry, kill": borrow, buy, or sell! Your three pieces are ... the Habsburg Fringe Tiara, the Belgian Scroll Tiara, and the Grand Duchess Adelaide Tiara. Thanks again to Sydney for answering our questionnaire, and don't forget to go check out Confessions of a Castleholic!